More verbal brutality from the prospective generalissimo of America. In this clip from The Young Turks, the anchors Bill Mankiewicz and Elliot Hill discuss another piece of raging, vile rhetoric from the current Republican front runner. In one of his speeches, Trump glowingly recounts an incident from ‘back a bit’ in the early 20th century, when the Americans were faced with a series of terrorist outrages. General Pershing responded by rounding up fifty of the terrorists. 49 of them were shot out of hand with bullets dipped in pig’s blood. The fiftieth was then released to tell his comrades about what happened. ‘And do you know,’ Trump concludes, ‘that for twenty-five years afterwards we didn’t have any problems. We need to do this, or else we’re not going to have a country’. Trump claims that this story can be found in the history books, but ‘not many, ’cause they don’t like putting it in. Only some.’ Mankiewicz and Elliot point out that the real reason it’s not in the history books is because it didn’t happen. It’s mythical. The incident Trump refers to supposedly happened during the Spanish-American War, when America took the Philippines from Spain. The Philippino people resisted. Mankiewicz points out that as they were the original people, they wouldn’t have wanted either Spanish or Americans. Trump calls the resistance fighters terrorists, but if they had been Americans fighting for America, or on the side of America, they would have been called ‘freedom fighters’. It’s horrible story, but it didn’t happen. He compares the incident, and the way it’s been left out of conventional history books because of its entirely fictional nature, with the way Republicans are trying to sanitise American history. In Texas, for example, the school board has voted to use books that don’t mention slavery, or don’t call it what it was, because it makes America look bad. This is one case where an incident that makes America look bad isn’t in the history books. Mankiewicz points out that if historians really were intent on putting in material just to denigrate America, that incident would be in there. Mankiewicz and Elliot also discuss the way Trump’s brutal rhetoric, combined with his confidence and easy oratorical style – for example, he asks his audience if they want to hear the tale – is actually desensitising people to the viciousness of what he says. He describes waterboarding as only a very small torture, for example. They point out that this is actually worse than if he’d said it actually was torture, but he believed that it worked and so was justified to protect America from terrorism. This wouldn’t justify it to them – it would still be horrible, but not as vile as simply calling it ‘a very small torture’. But there’s a tendency for people just to laugh it off, and say, well, it’s only Trump being Trump. And that’s dangerous, because it makes light of what he says and what he could clearly do. It’s a good point. Regarding the supposed use of bullets dipped in pig’s blood, or other pork products, the Israelis were supposed to be using them against the Palestinians. The idea is that some Muslims feel that they will go to hell if they eat even a scrap of pork. And so one of the newspapers over here reported that the Israeli army was using bullets containing small pieces of pork as part of a psychological weapon against them. As for its use in the Philippines during the Spanish-American War, that may be entirely mythical, but the Americans did carry out atrocities there with the intention of spreading terror. For example, after shooting Philippino freedom fighters, they tied inflatable bladders to the corpses and set them floating down rivers in order to make an example of those shot. And the warning about not taking Trump’s brutal rhetoric is also entirely correct. We’re back to Godwin’s Law again, but it needs to be brought up. During the Weimar period, there were Germans, who went to see Hitler speak simply because it was laugh. They wanted to see who he’d attack next. And very many Germans, and the British politicos too, really didn’t believe that he’d actually do what he said he would, in his speeches and Mein Kampf. Once in power, they thought he could be tamed and controlled into becoming a responsible, conventional politician. They were wrong. And in the resulting War that followed, forty millions died. There’s a bit in the Bertolucci film, The Conformist, where one of the characters tells the other that when he was in Austria, there was a man, who used to go round bars ranting. No-one took him seriously. ‘We all threw beer bottles at him’. The speaker abruptly concludes, ‘That man was Adolf Hitler’. It’s the same with Trump now. The temptation is not to take him seriously, because what he says is so outrageous, and the man himself so much a buffoon. But that’s underestimating him. The danger is, he means exactly what he says. 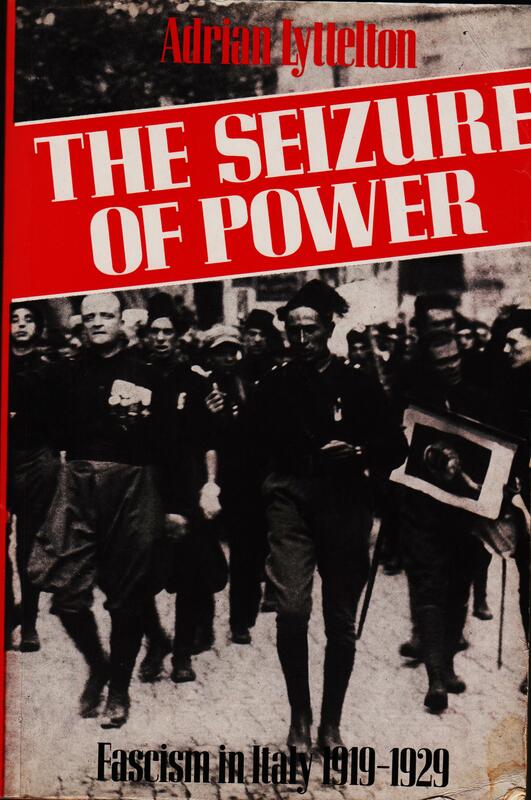 Cover of Adrian Lyttleton’s book, The Seizure of Power: Fascism in Italy 1919-1929, showing triumphant Fascists returning from raid on trade union headquarters. Mike over at Vox Political has posted this piece from The Canary, reporting that the UN’s International Labour Organisation has criticised the Tories’ Trade Union Bill. The bill would legalise the use of workers from agencies to supply labour during strikes. The ILO points out that this would effectively undermine the right to strike, by allowing employers to disregard strike action. Now cue right-wing ranting in the Daily Heil and the Express about evil foreigners hypocritically attacking noble Britain. No doubt they’ll also rant about how the unions cripple British business, and hold British workers to ransom, forcing them to pay the levy to the Labour party, etc. ad nauseam. The Tories have always hated organised labour and the trade unions, and have tried to get rid of them since the 19th century, when they passed laws against the as illegal ‘combinations’. Then there was the Taff Vale judgement, which ruled that trade union funds had no protection under law, and so could be pilfered with impunity. And then there’s the use of scab and blackleg labour by the employers themselves. I can remember hearing from older man I once did voluntary work with, who told me about the way union meetings had to be guarded from infiltration by the bosses’ spies. And now here comes Godwin’s Law again. With this piece of legislation, we’re back once again with Fascism. The Fascist parties all over Europe hated independent trade unions with a passion, and did their best to destroy them. In Nazi Germany trade unions were banned, for pretty much the same reasons the Daily Heil and the Express spews: they’re evil ‘Marxist’ organisations that exploit workers. In Italy, Mussolini’s Fascists formed their own trade unions to supply blackleg labour and break strikes. Unable to convince the mainstream, Socialist trade unions to join them after the Seizure of Power, they banned them and made it compulsory for workers to join the Fascist unions. And in Britain the copycat British Fascist groups that sprang up in imitation of Musso’s squadristi had much the same tactics. They included the British Fascisti, who used to career about in vans trying to break up strikes and workers’ demonstrations. Such organisations were extreme Right-wing Tories, rather than independent Fascists. When Oswald Mosley asked one of them what they would do about the corporate state, in which trade unions and the employers’ organisations were amalgamated into giant industrial bodies based roughly on the medieval guilds, their leaders promptly had a fit of the vapours and declared that it was ‘Socialism’. Nevertheless, the Tories continued trying to found alternative trade union organisations to break the traditional Social Democrat organisations. These included a Conservative trade union body, which was dissolved in the 1990s. Its leader then complained that the Tories were doing the work of the bosses. Well, duh! You only just noticed? And then there was the right-wing electricians union, which did the Tories’ work in the TUC and during the miners’ strike. And if we’re really going to go to the ultimate origins of Nazism, some historians of the Third Reich have traced it to ‘Yellow’ trade unions, set up by the employers for the benefit of their ethnic German employees, and to protect them from competition from Czech and other ‘Slav’ workers. No doubt we’ll hear a lot of Tory noise about how they’re protecting businesses and the public from the disruption of public services by wicked trade unionists and Socialists. And how they’re freeing the workers from having to enrol in trade unions, though that went long ago when they outlawed the closed shop, or having to abide by trade union decisions. It’s just more excused to break the unions through scab labour. It also reveals how much the Tories hate the working people of this country, and how close they are to the Black Shirts, Fascists and Nazis. I’ve reblogged already a piece by Mike on Tory gerrymandering and their proposal to cut the number of MPs so they can get about 20 more for themselves. This is another story that shows the absolute contempt the Tories have for electoral regulations when it comes to themselves. Last Tuesday, Mike put up this story from Channel 4 news, about how the Tories went over the £100,000 spending limit for bye-elections in order to get Robert Jenrick elected as MP for Newark. http://voxpoliticalonline.com/2016/02/09/tories-exposed-they-apparently-tried-to-buy-three-by-elections-breaking-legal-spending-limits-on-all-of-them/. From his previous record of standing in elections, it seems the Tories are desperate to get him elected somewhere. There’s a graphic up there showing some of the other places where he’s tried his luck, like Southwell, Vincent Square in London, Newcastle-under-Lyme, Croydon, Shropshire and Herefordshire. All of whom seem have said, ‘No’, forcing him to go on his way. This should, at least, make some of his constituents wonder if his sympathies might be a trifle mercenary. At the very least, when he says he’s proud to be a member of Newark’s community, he’s said it something like five times before, all no doubt with the same level of sincerity. And given the increasing nepotism in British politics, you’re left wondering who he’s related to, or with whom he’s having an affair. Clearly someone decided that they wanted him in parliament, despite his dismal record of not getting elected, campaign after campaign. So who’s he connected to, and what backs are he scratching. And now for a bit of Godwin’s Law. Yes, I’m going to compare the Tories to Fascists once again. But they deserve it, and the parallels are there. One of the great myths about European Fascism is that they took power through their sheer popularity and physical force. In Italy, this centres around the March on Rome in about 1921, the legions of Fascisti marched to overthrow the liberal Italian state, the Mussolini at their head. In actual fact, they took power through the cowardice of the existing authorities and very clever electoral manoeuvring, including a piece of truly astounding gerrymandering. Mussolini entered the Italian parliament as a partner in a right-wing coalition with one of the factions in the Liberal party, in order to give them enough of a majority to form a government. Despite their bullying, violence and intimidation, the actual numbers of people voting for Il Duce and his thugs were small. When he put himself up for election in his hometown of Padano, Mussolini lost. By a very long margin. The Fascists only got into power by declaring Italy as single electoral district, and thus manipulating the system so that they got an absolute majority. If the previous system of electoral districts had remained in place, the Fascists wouldn’t have won the election and would have stayed a violent, nasty, but limited force on the right. And as for the March on Rome, well, the head of the Roman police was a cop of the old school, who regarded Musso’s forces with the same contempt that Colonel Gruber had for the Italians in the BBC comedy, ‘Allo, ‘Allo. They were a ‘rabble’, and he was confident that he could disperse them with the a few good shots when the crunch came. Unfortunately, King Emmanuele II didn’t have his backbone, and caved in. They were allowed into Rome unmolested, and the king offered Mussolini the leadership of the Italian state. This is another piccie I found over at 1000 Natural Shocks (over 18 site). 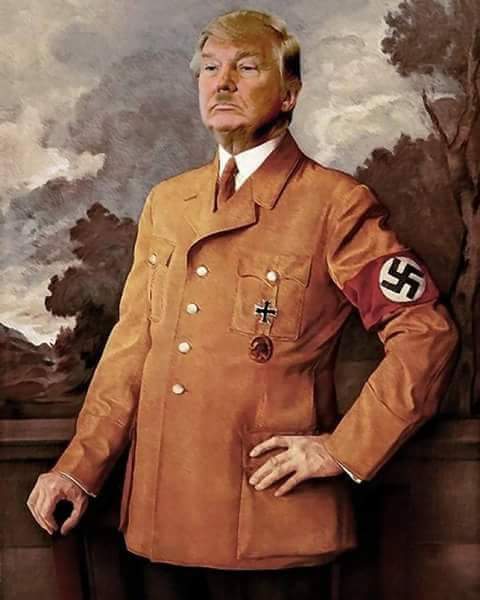 Yeah, it’s a photoshopped image of Trump as Adolf in one of the most famous Nazi propaganda paintings. Yeah, it’s like a return to Godwin’s Law, which states that sooner or later in an internet argument, someone will accuse the other of being like the Nazis. 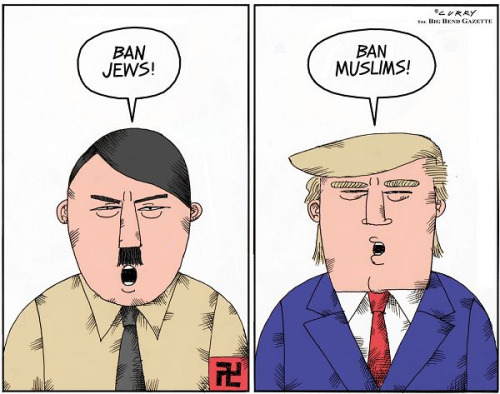 On the other hand, this is exactly what he is in his comments about keeping Muslims out of America. So unlike most cases of Godwin’s Law, this time it’s real.